When plumbing issues arise in your Silver Spring home, count on Master Plumbing for quick, reliable service. Silver Spring, named after a mica-flecked spring of water discovered in 1840, is a wonderful community to live and work in. A vibrant, growing community just outside Washington, D.C. in Montgomery County, Silver Spring homeowners know just how important great plumbing is for the utility and beauty of their homes. And when plumbing issues come up, Silver Spring homeowners can rely on Master Plumbing for quick, reliable service at a fair price. 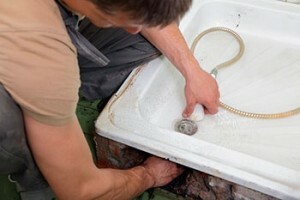 Here are some of the essential plumbing services we can provide for your home. Clogs and drainage blockages will happen at some point in the life of any plumbing system in Silver Spring. However, it is important to make sure these interruptions are addressed as soon as they are noticed. Luckily, technology has advanced to the point where a video camera can be appended to long, flexible rod so that a plumber can see exactly what’s going on inside your plumbing pipes and make an accurate diagnosis of the problem. Master Plumbing makes use of this technology to eliminate a costly manual investigation and get your plumbing in good working order faster. Looking to buy a new home in Silver Spring? We can also use our video plumbing technology to check out the home’s plumbing system as a part of the home inspection process! Residents of Silver Spring understand the importance of a well-designed, beautiful bathroom and kitchen in their homes. Whether you decide to remodel your kitchen or bathroom yourself or go with a professional contractor, it is critically important to ensure that all new and existing plumbing connections are made correctly and stand up to code. In addition, if you’re planning to construct new walls, you’ll need a licensed plumber to place them and your plumbing drain pipes. No matter what kind of plumbing services you may need in Silver Spring, you can rest easy with Master Plumbing working on your home’s plumbing. We will give you a fair price for the work that we do and pride ourselves on our honesty, integrity, and courtesy. Your satisfaction is our number 1 priority! Give Master Plumbing a call at (301) 650-9100 or contact us online to get more information on how our expert plumbers can help you with your Silver Spring home’s plumbing system. We have received Angie’s List Super Service Award recognition for plumbing and drain cleaning every year since 2007, in addition to the Best Plumber award from Best of Bethesda. We are fully licensed, bonded, and insured and our service is unparalleled. Give us a call today—you won’t regret it! To see examples of our projects, follow us on Facebook, Twitter, and Pinterest.